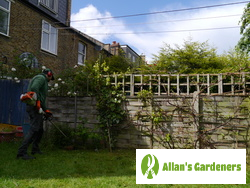 Many services for gardening in London charge for long hours where you don't really know what you're going to be getting - not with Allan's Gardeners. You'll meet your team of two professional gardeners first, and have the opportunity to show them around your property and talk about what you want them to achieve in the time you've chosen to book them for. It's like having two extra pairs of incredibly well-trained hands! Choose any day for an appointment you need - we work on weekends and Bank Holidays as well! There are many other ways we can help you, like with garden design or gutter cleaning. Create your ideal package today and make savings! After arranging your appointment, you'll meet your team of two garden maintainers from London at the gate or at your front door at the time you've specified. Don't worry if the gardeners need to go through your house to reach your back garden for example - they are professionally uniformed, and can even put down coverings if you prefer. All of their equipment will be cleaned, and most is lightweight enough to carry through. You'll specify what you want the gardeners to do, and they will get started after you've confirmed you're happy with your quoted rate. Our customers use us for services such as garden care, lawn mowing, garden clearance, and a whole lot more besides! We know that inviting someone you don't know onto your property can feel like an invasion. 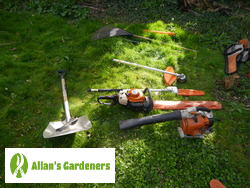 At Allan's Gardeners, we carefully screen, interview and train each member of the gardening teams, making sure they have the needed knowledge, motivation and diligence to provide you with the service you want, the way you want it. In addition, even the standard tools we use, like trowels, rakes, spades, shears and secateurs, are hand-picked for being the most durable and effective examples of their kind. Don't forget, the gardening team will bring all the needed equipment for the tasks you require. Book Today - Your Gardeners Are Waiting To Meet You! Get in touch with us today, and set up your appointment for tomorrow - or whenever it's best for you. We operate seven days a week including weekends and Bank Holidays, so it's never a bad time to set your booking. The first step of providing you with garden maintenance is to give you a no-obligation visit from a team of two professional gardeners. As we would already have received preliminary information about your requirements and the type of service you require, the gardeners will arrive with the proper tools and equipment, ready to begin work! You'll confirm what you want to be done, show the technicians in person where everything is if you like, and we'll reaffirm your quoted price. Or by using our chat facility to speak to one of our live advisers now - get typing!